Named for its side-winding locomotion, it is Nevada’s smallest rattlesnake, reaching up to 31 inches in length. Primarily inhabiting valleys and bajadas, a series of backward J or S shapes left in loose sand indicates one has passed by. It will partially or nearly completely bury itself in loose sand or gravel when at rest. 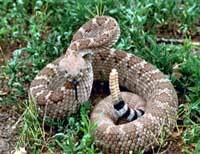 It is sometimes referred to as the “horned rattler” because of the modified scales above its eyes. Also called the Mohave Green, this snake mainly inhabits valleys and bajadas. Notice the light to medium green body with yellow bordering darker diamond on the back. A pronounced dark striped edged with yellow to yellow-green runs along both sides of the head angling down through the eyes to behind the corner of the mouth. The tail has contrasting narrow black and broad white bands. The venom is very potent. Inhabiting rocky slopes and hills, this rattlesnake is typified by its salt and pepper appearance. It has the most variable body color and pattern of Nevada’s rattlesnakes. Two sub-species occur in Nevada: the Southwestern speckled and the Panmint. There are no obvious facial stripes, and the Panamint has a more well defined body pattern, the salt-and-pepper appearance being faint or lacking altogether. This is the largest of Nevada’s rattlesnakes. It typically has a body length of 3-4 feet, and is able to deliver a large volume of venom. It is found only in the Lake Mohave, Searchlight and Laughlin areas of southern Nevada. Its distinctive markings include the diamond body pattern edged with white and black on brownish background; facial stripes, and equally broad alternating black and white banding on the tail. 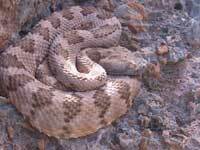 A habitat generalist and widely distributed over the western U.S., it is represented in Nevada by the sub-species know as the Great Basin Rattlesnake. Its coloration is variable, but primarily browns and grays. Facial stripes can be faint to pronounced. With exception to localized overlap with the other rattlesnakes of southern Nevada, the Great Basin Rattlesnake is the only one inhabiting the northern two-thirds of the state.